....Edwards and his campaign officials were unaware of the illegal nature of the contributions and the Edwards campaign cooperated fully with the investigation, the U.S. Justice Department said in a news release. 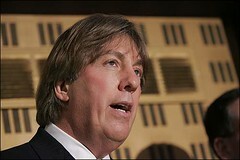 On the obstruction of justice charge, Fieger tried to impede the grand jury investigation by shifting responsibility for the contributions to a deceased officer of the Fieger firm, attempted to mislead the grand jury by telling witnesses false information which he expected to be repeated and attempting to conceal an incriminating document, the indictment alleges. In his statement, Fieger said federal officials have "repeatedly threatened to prosecute my employees unless they lie about me." Spence told The Detroit News he and Fieger will speak to the media Tuesday morning at a news conference at Fieger's office. "We will contest this and fight it until we haven't any breath," Spence said. I don't envy Fieger. His life is bound to be miserable over the course of the next year as he fights this Indictment. And I disagree with this article that says his indictment may be trouble for Edwards because of his heavy anti-lobbyist contribution message. The feds have said the campaign was in the dark and Fieger, while a trial lawyer, like many of Edwards' past contributors, is not a lobbyist. Edwards has strong labor union support in Michigan and I suspect he will keep it. I doubt Fieger's indictment will affect the race, particularly since Fieger is a hero to many Democrats in the state who may now view him as the target of an unfair, politically motivated prosecution by a corrupt Republican justice department. But you can't be too cynical nowadays. What is the connection between this and the firing of the U.S. Attorneys, meaning more precisely, getting rid of those who wouldn't file these political prisoner cases? Doesn't feel so bleak that way. But I more than credit your point. That seems to be precisely the reason these folks got fired. They wouldn't bring weak, partisan cases. Or enough of them. A well known Democrat is charged with a serious crime and you blame the Repubs? If the contributions had been made to Senator Clinton, Edwards would blow this up to show how evil she is to be taking the money. And then deny it.